Beautifully updated waterfront home on an over-sized lot at the end of the cul de sac. NEW custom designed white transitional kitchen with quartz counter tops, Wolf cook top and oven, stainless steel appliances, large custom quartz breakfast table and prep station, pull out garbage dispenser and pantry. Gorgeous NEW large porcelain tile floors throughout the downstairs, custom window blinds, light and bright with southern exposure. Oversized fenced in back yard with pool and marble pavers, covered and screened in patio. Downstairs guest bathroom with full cabana bath. Large Master bedroom with balcony overlooking the lake and garden. Master Bath with marble bathroom floors, custom blinds, separate shower and tub and dual sinks. Large laundry room with front load washer and ....read moreBeautifully updated waterfront home on an over-sized lot at the end of the cul de sac. NEW custom designed white transitional kitchen with quartz counter tops, Wolf cook top and oven, stainless steel appliances, large custom quartz breakfast table and prep station, pull out garbage dispenser and pantry. Gorgeous NEW large porcelain tile floors throughout the downstairs, custom window blinds, light and bright with southern exposure. Oversized fenced in back yard with pool and marble pavers, covered and screened in patio. Downstairs guest bathroom with full cabana bath. Large Master bedroom with balcony overlooking the lake and garden. Master Bath with marble bathroom floors, custom blinds, separate shower and tub and dual sinks. Large laundry room with front load washer and dryer and custom storage cabinets. Stone decor wall in family room with custom wood cabinets and shelves, 70 inch TV, electric fireplace. NEW roof and brick paved driveway, custom front door, accordion shutters throughout, 3 car garage and central vac and dual zone AC. Move in ready, this home has it ALL! 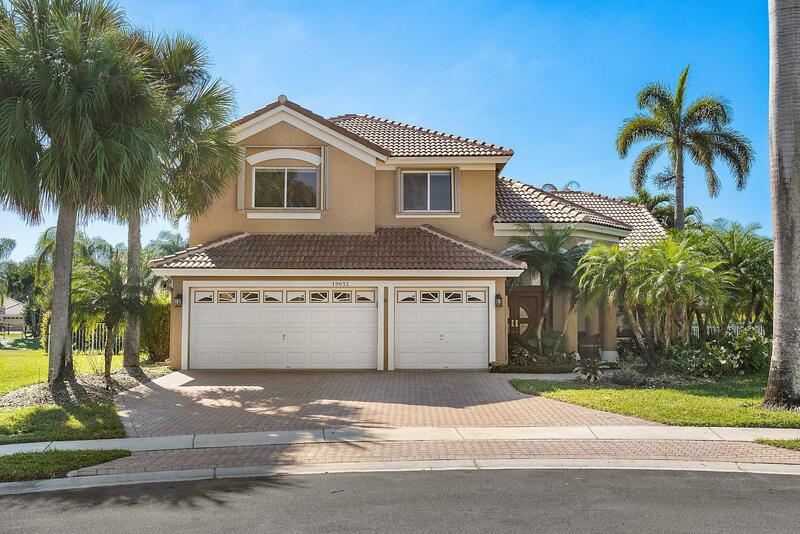 Boca Isles South is a 24 hour man gated community with clubhouse, lakefront pool, tennis, fitness room, tot lot and more. © 2019 All rights reserved. All listings featuring the BMLS logo are provided by BeachesMLS Inc. This information is not verified for authenticity or accuracy and is not guaranteed. Copyright 2019 Beaches Multiple Listing Service, Inc. IDX information is provided exclusively for consumers' personal, non-commercial use and it may not be used for any purpose other than to identify prospective properties consumers may be interested in purchasing. Data last updated 2019-04-25T12:04:09.777.